The Leading Economic Indicators for the month of February 2015 highlights trends in Consumer Price Indices (CPI) and inflation, interest rates, exchange rates, international trade, agriculture, energy, manufacturing, building and construction, tourism and transport. Consumer Price Index (CPI) increased from 153.43 points in January 2014 to 154.14 points in February 2015. The overall rate of inflation expanded from 5.53 per cent to 5.61 per cent during the same period. In February 2015, the Kenyan Shilling depreciated against the US dollar while appreciating against the other major currencies. 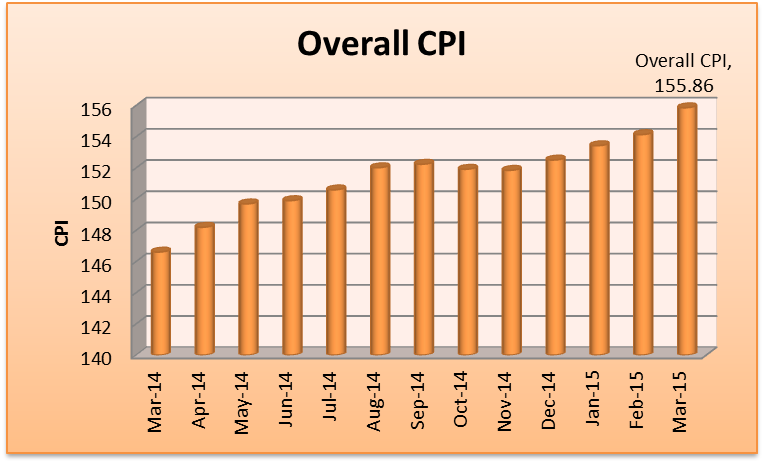 Kenya National Bureau of Statistics hereby releases Consumer Price Indices (CPI) and inflation rates for March, 2015. These numbers have been generated using data collected during the second and third weeks of the month under review. The prices were obtained from selected retail outlets in 25 data collection zones located in 13 urban centers. Kenya National Bureau of Statistics hereby releases the Producer Price Index (PPI) for the February quarter of 2015. Producer Price Index measures the gross changes in the trading price of products on the domestic and the non-domestic markets, at all stages of processing. The price changes are measured from the perspective of the producer. 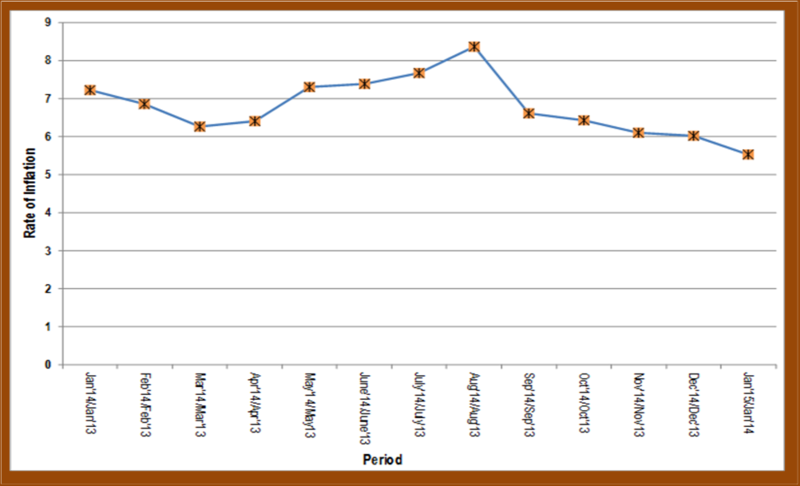 The producer prices are collected as at 15th February, 15th May, 15th August and 15th November of the year. These dates corresponds to the first, second, third and fourth quarters respectively. The Kenya Petroleum Refineries Limited (KPRL) stopped operations in September 2013. As such, the weights have been re-adjusted accordingly. 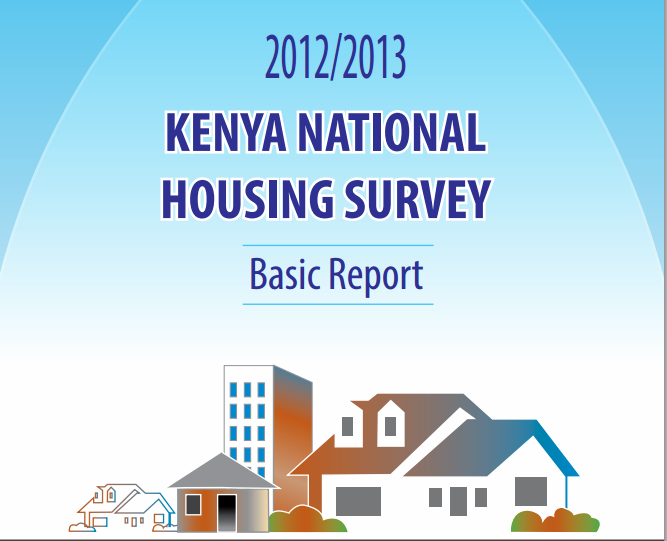 The Kenya National Housing Survey (KNHS) was carried out in 2012/2013 in 44 Counties of the Republic of Kenya. • Renting households spend more than 30% of their income on rent monthly. This percentage increases to 47% when housing related utilities are included. • Over 90% of the financial institutions interviewed indicated that they did not have specific products geared towards savings for mortgage. • Housing developers quoted, access to affordable land (45.9%), high returns on investment (43.7%), and prospective future returns on investment (41.4%) as the key factors in determining where to develop. Based on the survey findings, a one stop shop system is proposed where all approving bodies will sit together to analyze development applications received and give feedback on the applications within a reasonable time. The survey collected massive data on various aspects of housing which was not analyzed for this basic report; we therefore recommend that the government prepares analytical reports from this data. This will provide useful information to both public and private sectors players in the housing sector. This report is structured into eight chapters. Chapter one provides the background of the 2012/2013 KNHS. Chapter two presents the survey methodology while chapter three summarizes the findings of the renters and owner occupier characteristics. Kenya is one of the most growing Countries in the African continent with an annual growth which makes hope for the best in the next future years. At the 2015 KIICO (Kenya International Investment Conference) expert marketers in Kenya discussed the investment and trade situation within Kenya, but also within the African Countries. Kenya is actually following more and more closely the western development example, becoming a Country whose overture towards the modernization is always more at reach than in the past times. The KIICO in 2015 took place on 23rd to 25th November and the Kenyatta International Convention Center (KICC) whose main theme of debate was “Think investment, made it Kenya”. Kenyan industries are growing quicker in the latest years and this can be seen more evidently in certain industrial sectors, including tourism, infrastructures, communication, telecommunication, construction & building and manufacturing. Investors who need to learn more about the most growing and profitable industries in Kenya can read this PDF online document about the economic situation in Kenya. Actually, not all investors might be expert in Kenyan industries and a complete overview about this topic is without a doubt the best tool to guide new investors towards their most profitable investment in Kenyan industries. For investors who are more exigent or who feel they need a more direct and personalized support there are several different financial companies out there. But possibly the best solution is to choose a flexible, open-minded and modern company like WashingtonCapitalGroup.com . Washington Capital Group is based in Delhi, India, and its team is made of only educated and graduated financial advisors and expert traders and financial managers whose goal is to meet clients / investors’ goals. Actually, when investors earn money from their investments, Washington Capital Group as a company does also get its revenue: as a consequence, making investors earn more money means for the company of Washington Capital Group to work for both clients and company’s interests. As you can see, this achieves a perfect alignment of interests between the clients, on a side, and the company on the other side. Each single investor is a unit with personal financial goals and a financial liquidity that are different because are closely personal and ever-evolving. Actually, personal financial conditions are subjects to many factors through the course of time, such as unexpected expenses, urgent need of money for a necessary and unpredicted cause and so on. At Washington Capital Group investors can find the most skilled and expert financial advisors in many fields: from financial management in all facets to tax advisory and money consultancy. The range of services provide by the team of Washington Capital Group is really wide and it includes all facets of financial services, banking solutions and insurance solutions. Moreover, the team of Washington Capital Group works closely in contact to clients in order to meet their evolving needs. For this reason, the investment portfolios created by the financial manages at Washington Capital Group are highly flexible and adjustable, so that each single investor can find the most suitable and adherent portfolio including profitable markets and industries to their personal exigencies and needs. Consumer Price Index (CPI) increased from 152.51 points in December 2014 to 153.43 points in January 2015. The overall rate of inflation declined from 6.02 per cent to 5.53 per cent during the same period. In January 2015, the Kenyan Shilling depreciated against the US dollar and the Japanese Yen while appreciating against the other major currencies.